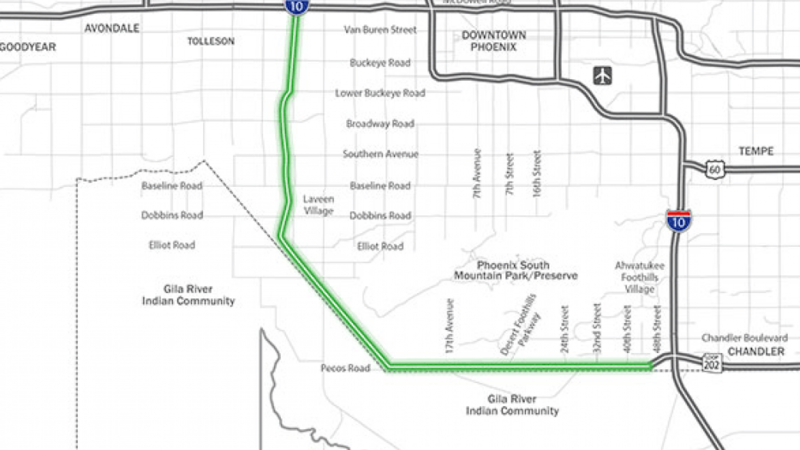 A new stretch of State Route 202 in the Phoenix area will be constructed as a public-private partnership, a first for the Arizona Department of Transportation, ADOT announced last week. The controversial South Mountain Freeway stretch of SR 202 (a.k.a. Loop 202) will run southeast from Interstate 10 in west Phoenix to I-10 in the Ahwatukee Foothills area. Construction is expected to begin later this year, with the freeway projected to open by 2020. Connect 202 Partners, a group that includes several construction and design companies, was chosen as the developer. ADOT said in a news release that the public-private partnership — the first for a highway in Arizona — will enable the freeway to be completed at an accelerated pace and a lower cost. Under the partnership, the private developer will design and construct the freeway, then maintain it for 30 years. ADOT said it expects to finalize the contract with Connect 202 Partners by mid-February. To learn more about the South Mountain Freeway, click here.